It’s only been two years since Michael McLeod was selected 12th overall by the New Jersey Devils at the 2016 NHL Draft, so even if he doesn’t make the team’s NHL roster this October there shouldn’t be any panic. 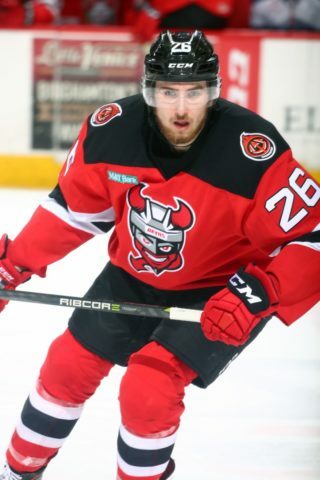 A full season in the AHL with the Binghamton Devils might be just the seasoning that the 20-year-old needs before making the jump to full-time NHL status. Some first round picks make the jump to the NHL and that sometimes may skew Devils’ fans viewpoints (or patience) because they either perform really well (Nico Hischier) or leave a lot to be desired (Pavel Zacha). But keep in mind, he doesn’t turn 21-years-old until February 3. “He’s just matured, I think physically and mentally. I think everything is not new to him anymore and he feels a little more comfortable in his own skin if that’s the right way to put it. He’s still got a ways to go,” Devils assistant coach Rick Kowalsky (who coached McLeod for six games in Binghamton at the end of last season) said following the team’s first preseason game. “I thought the second half of the third period was his best, he looked like he wanted to have a hand in winning that hockey game. He didn’t sit back. You saw his speed, he attacked a little bit more off the rush. I just think understanding the pro game and how important your positional play is, not just defensively and without the puck, but with the puck. It’s something that I talked to him about when I had him in the minors, his timing,” added Kowalsky. 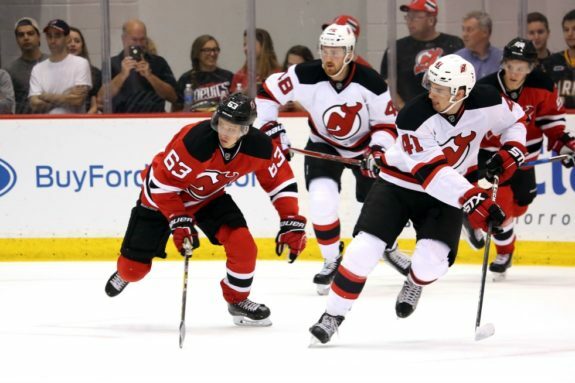 We spoke with McLeod following the Devils preseason opener to gauge his confidence level during his third NHL training camp and find out if any players have helped him find his way as he transitions from playing against teenagers to playing against men. The Hockey Writers: First preseason games can be kind of rough for everyone, how’d you feel out there tonight? As the game went on you seemed more comfortable and were definitely more noticeable from up top. Did you feel that way? Micheal McLeod: I felt better as the game went on. There were a ton of penalties throughout the whole game, especially early on, so it was tough to get into a rhythm with your linemates at 5-on-5 and to establish my forecheck and that kind of game down low. I felt pretty good in the third period where I was making some plays and taking it to the net. I think our team also got better as the game went on. The Rangers got on us for a bit there in the second period but we had a strong pushback and we were working it really good for a few shifts in a row there. THW: You got an assist on the power play goal by Nick Lappin. It looked like you had a few defenders converging on you, what did you see there? MM: I got a few shots off earlier in the game on the power play and they were looking for the shot. I saw that opening out of the corner of my eye and I just slid it to Lapp and he made a great play to finish it off. 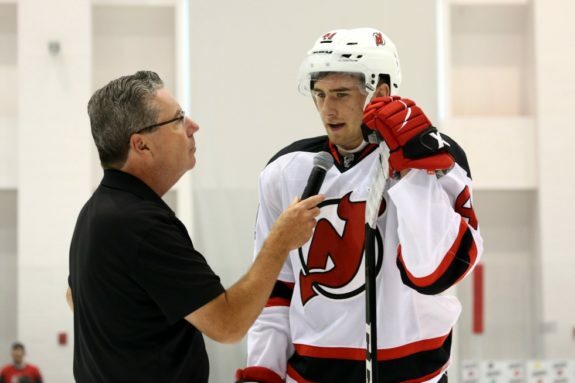 THW: Do you feel like there is a spot on the Devils NHL roster for you to take right now? MM: I’m feeling pretty good about my game and I think I’m doing what the coaches want us to do. Playing hard, playing with grit, doing the right things. I’m really focusing on the details. I’m hoping there’s a spot there, but I’m just looking to improve every day. THW: With a lot of experience in this locker room has there been anyone who has gone out of their way to make you feel comfortable and helped you navigate the rigors of being a true NHL professional? MM: Everyone in Binghamton at the end of last season was great. Last year when I was here I got injured in camp and I was here in New Jersey skating a lot with (Travis) Zajac and (Brian) Boyle. Those guys really showed me what it’s like, gave me some pointers, taught me about taking face-offs and really just talking to me every day helped. They’re just nice guys and that stuff goes a long way.